Beauty Products I have been loving! Lovers, Its been a while! Thank you for coming back and checking out the blog. Whilst I have been working on ways to adjust to the new year for myself and my family, business and my career, I have also come back with a new blog template. I hope you like it? Many thanks to pipdig.co who have patiently worked with me over the years whilst I transform this space into something that is totally me! Anyway, so much to come, but lets look at what I have been loving recently for beauty. Starting with Skincare, Makeup and of course Tools. My products relatively remain the same as I am the type of person to rotate around products that I know work for me... however, recently, I have been sent some amazing products which I am totes excited about which I want to share with you! My particular favourite mask is L'Oreal Pure Clay Masks in all 3 different types. Depending on my mood, or actually what I have done with my skin that day- I use a different type of mask from the collection. On a day where I have worn a full face of makeup, my face tends to produce extra oils, particularly on my nose. I then use the Pure Clay Purity Mask which is perfect for mattifying and extracting oil from skin. 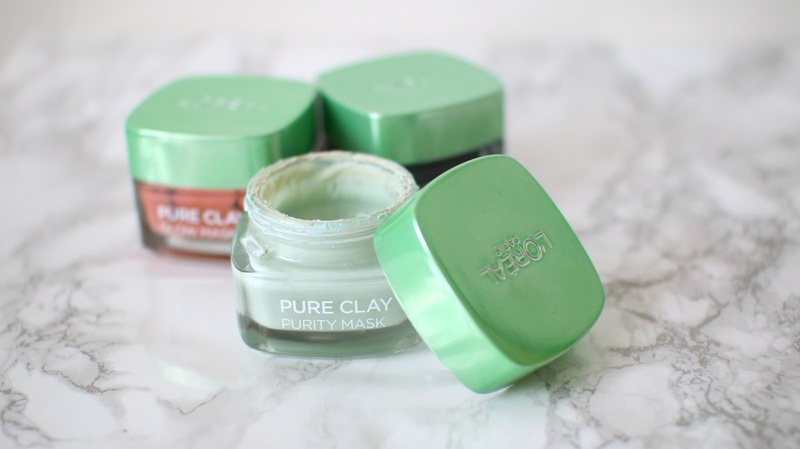 I use the Pure Clay Glow Mask on days where I have not worn makeup and require exfoliating and an extra glow. This mask is perfect for brightening skin for those of us who have dull, dry skin. And finally the Pure Clay Detox Mask is what I use on occasions where I want to tackle those pimple and black heads. This product is for clarifying the skin and removing those bugs imbedded into our pores. All in all, I rotate all three masks on a daily basis. For the past year I have been using this product by The Body Shop, The Drops of Youth Range was quite popular last year. I use this cream Drops of Youth Youth Cream to moisturise my face at least twice daily. It feels soft, and hydrates my skin all day/night long. Perfect for using after a thorough face wash especially after using a face mask. What is really important for me is my eyebrows! It is a must That I have amazing Brows... and by using the Benefit Goof Proof Brow Pencil, My Brow game has completely changed! The shade I use is number 6 Deep. Benefit Cosmetics have been so sweet recently, supplying me with so many lovely new products from PR, and of course, I have been tucking in and experimenting with these new releases. This brow pencil gives me a defined and perfect Brow shape! I would have loved to show you what has been my favourite concealer, or even blush, so you know what I have been using, but honestly, nothing has changed. However, the foundation that has literally caught my heart is the L'Oreal True Match Foundation. The formula is amazing. Blends immaculately, long lasting, oil free and an absolute perfect match. Last year, they extended their shades, and of course, that was a joyous moment. I love how deep and rich the tone is and how much it enhances my chocolate skin tone. My shade is in 9.R/9.C- Deep Cool. Some of you may already know, I have my own cosmetics line- Amby Rose, where we specialise in affordable beauty tools such as Full Makeup Brush Sets, Eyelashes and Matte Liquid Lipstick. I use these brushes everyday for makeup application and am able to achieve a full face using each brush. I would be doing a separate blog post on the entire brand soon as I have only got posts up from my YouTube channel. The Original Dozen Brush Collection- consisting of 12 makeup brushes 4 for the face and 8 eye brushes. We also released our 5 Face Brush Set in 2 styles. This super soft and amazing brushes have changed my makeup game entirely. Be sure to wait for a full review coming soon, but honestly, not to be biased but.. these are the best brushes I have ever used! The railway Recruitment board has completed online application form. now it will go to conduct written examination as soon as possible candidates download RRB ALP Admit card 2018 and go to atampted examination. If you are wondering who can provide you with coursework help or free coursework assignment samples, then you can avail our services. We ensure that our team provides you with coursework assistance and helps you meet your deadline efficiently.We are most reliable academic solution providers on the internet that delivers professional support when you need help with writing a report. In fact, the website has been in the service for more than a decade, and if you think you need professional report writing help for your pending task, this is the right place to get started.